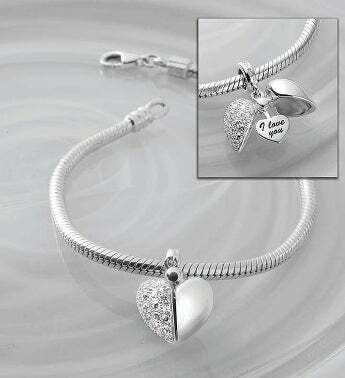 Reveal what’s in your heart with our beautiful Secret Message charm bracelet, by Chamilia. A sterling silver bracelet featuring a sparkling heart charm accented with Swarovski® crystals that opens to reveal a hidden “I Love You” message. It’s a dazzling and romantic surprise she’ll always treasure.